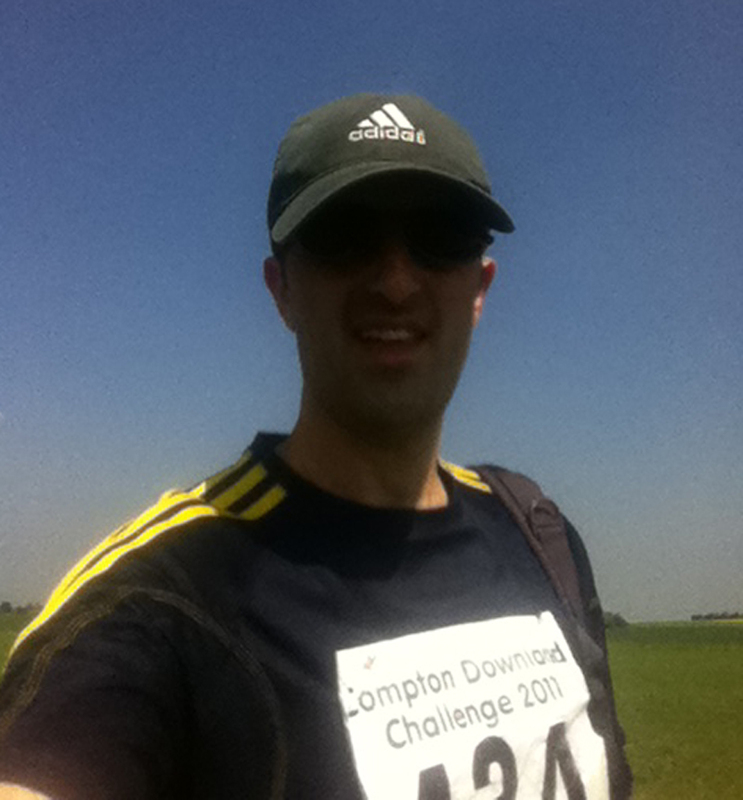 I took part in the Compton 40 Challenge run with Stouty and Sue (Fetch: Stouty & Capricorn) whilst Stoutys mate Harris was also participating in the 20 mile version. Prior to the race we caught up with fellow Fetchies Maureen (Gijima) and Allan (Ogee) (Hello guys!). The recent good weather showed no signs of abating and so we expected a very warm day as we lined up for the start of the race. My pre-race strategy was to take it easy and aim for a finishing time of 8hrs which would represent over an hours improvement on last years poor miserable effort and which was well within reach. Stouty and I started off together as usual and managed 8.30 – 10 minute/miles for the first 9 or so miles through the undulating scenic landscape. Normally, Stouty leads the way but today the heat was starting to get the better of him and for once he was the one suggesting the breaks. We took a walk up the large hill at about mile 11 and carried on for a couple of miles before Stouty took a short walking break as I continued on. Unfortunately, that was the last I saw of him and so the majority of the race was run by myself with a few odd conversations as I caught up with a few people or as a few people overtook me. Miles 10-20 were pretty much run/walk but the heat was starting to get to me as my body temperature felt hot and I kept finishing the water in my hydration pack (which was topped up 4 times during the race from less than 1/4 full each time). The majority of the course was undulating and some parts were quite exposed meaning little escape from the full effects of the sun. I caught up with Harris at the 14-15 mile mark. Unfortunately, he wasn’t having a good time of it either and was struggling on. 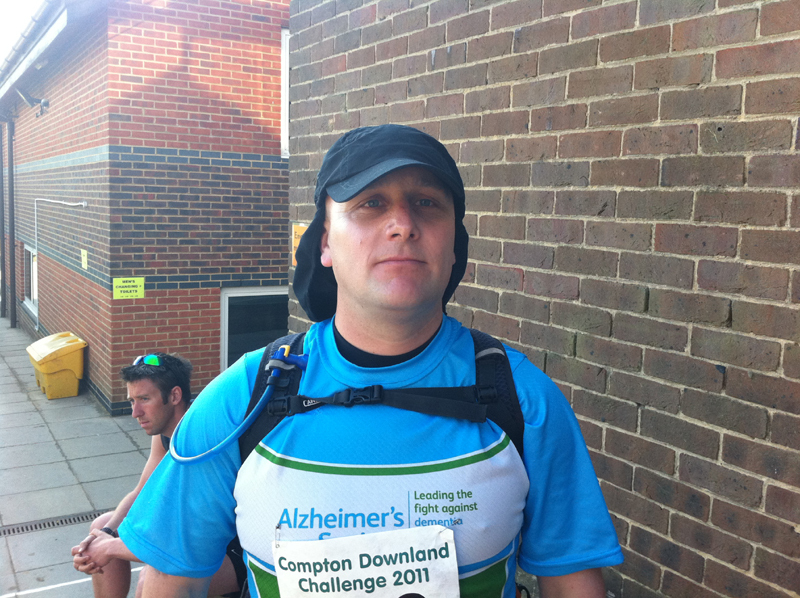 2 marathons in the last 2 weeks plus the heat was eventually catching up on him but he did manage to finish the 20 in about 3.35. Just before the 20 mile point, I left a message with the marshall at the checkpoint to tell Stouty he had better not quit on the 40 as I took the right path for the second 20 mile loop (I’m sure he would appreciate that… not), I also gave him a quick call on his mobile and managed to speak to him at the point where he was debating whether to carry on or not as he wasn’t feeling great. He had been with Sue and Maureen at this time and I think peer pressure forced him to carry on! I had reached the half way point at about 3.30 giving me a comfortable 4.30 to do the second half. At that point I was half thinking if I could just run a few miles I could then walk 4 miles an hour and still get under 8 hrs. As the mind wandered, I decided to have some lunch (energy gel and some flapjack) and try and motivate myself into a bit more of a plod. The second half of the race for me was pretty much more walk/run (the extreme version of the Galloway strategy). Sue caught up with me around mile 25 and we carried on together for a couple of miles before she carried on ahead. 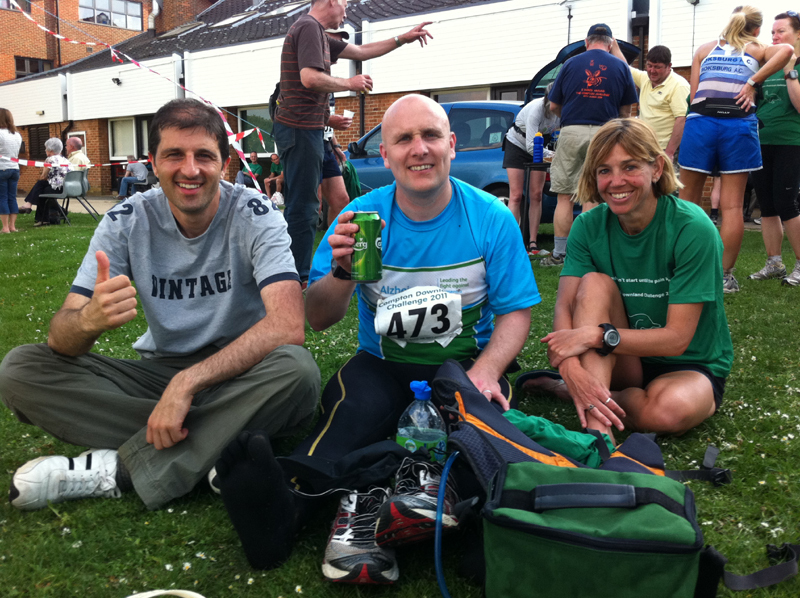 The rest of the race was simply about ticking off the miles, walking a bit, running a bit, drinking a lot and trying to keep going. The iPod came out for the last 10 miles to try and take my mind of the run which seemed to help. I spoke to Stouty again on the phone, who was continuing on and only about 2-3 miles behind me. The sun did drop behind some clouds for a little while which did noticeably reduce the heat and I felt a little stronger so I managed more of trot for the last 6 or 7 miles towards the end. At this point, you could see the odd sporadic runner ahead or behind but there was little company for much of the race. Looking at the watch, with a few miles to go I was going to be comfortably under the 8hr mark which was the little motivation I needed to keep going and I jogged the majority of the last few miles to finish in 7.36 – 7.37. Overall, I had met my target of under 8hrs which was about 1.15 quicker than last year (not one to talk about to be honest) but in reality I had walked a fair amount of the way but the warm weather was a major factor here. So I guess it’s job done, but there’s plenty of room for improvement in a future year. Sue had already finished (4th lady I believe) in around 7.15 which was a great effort. 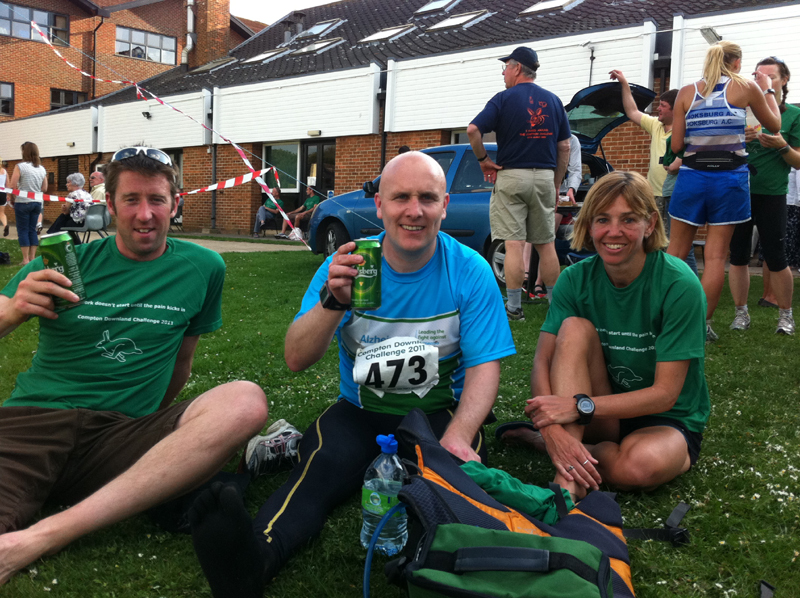 Maureen came in at 7.55 having run the entire race without a bottle or hydration pack as far as I could see (mad!) and Stouty came in at 8.25 but had really struggled with the heat today. We sat around at the finish for an hour or so, supporting the other runners coming in. Harris had kindly gone home and returned with iced water and beer for us aswell (Stouty = beer, me = water) so we had a bit of a chance to cool off before heading home. For your entry fee, you got a T-Shirt plus food and drink around the course and a cooked meal at the end so it represented good value for money although personally I would have preferred a medal to a t-shirt. Interestingly over the past few years the weather in late April has varied from snow to rain/wind/mud to todays heat so you’re never sure what you may get from the Compton run! The marshalling was good and the course markings were excellent with arrows, ribbon and chalk floor marking around the entire course meaning I didn’t have to check my directions at all really despite by fairly unfamiliar with the area. As the event is fairly local to us, it’s another no brainer for us and a good chance to support local events.